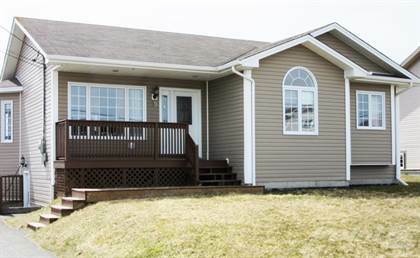 Centrally Located Bungalow! Thoughtfully laid-out, this home boasts an open concept design with a touch of elegance and practicality. The kitchen sports ginger birch cabinets, new backsplash and stainless steel appliances as well as an island with breakfast bar. Bayed walls in the dining nook, as well as an exterior door provide extra space, ample sunlight and access to the back deck for barbequing. The large living room at the front of the home has great sight lines to the kitchen. Down the hall are 3 bedrooms including the master which offers a 4 piece ensuite with a corner jetted tub and a large walk in closet. The fully developed basement offers plenty of room for a family and includes a family room and office as well as an additional fourth bedroom and a third full piece bath. The property is landscaped with a paved driveway, fenced backyard, storage shed and a large back deck and front patio. Ideally located near a school, recreation, and marina, it is the center of it all. $3000 to the purchasers on closing. Call today! Hi, I'd like to find out more information about 19 Bishops Rd. Thanks so much!